58 types of “REMS” modeling effect variations, with up to six simultaneous effects (including noise reduction) plus a volume pedal. 16 drive/amp types and 10 cabinet types that simulate the sound of some of the most sought-after amps. A wide range of effects with quality that rivals dedicated units. Full parameter editing of all effects in four effect categories (pre-effect, drive/amp, modulation, delay/reverb). 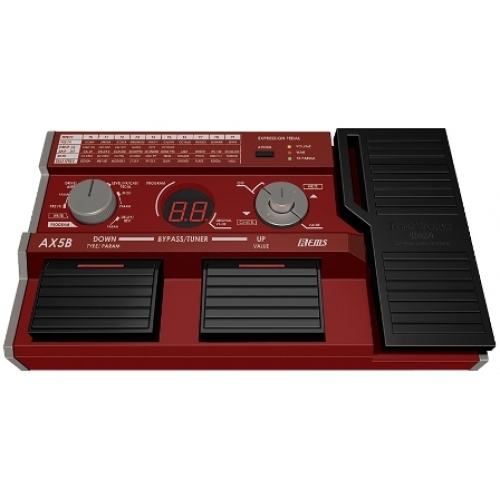 An expression pedal that you can use to control volume, wah, or nearly any effect parameter, giving you a virtually limitless range of expressive potential. 80 programs at your beck and call, with 40 presets and 40 user sound programs that can contain your favorite effect settings. Two-way power – use batteries or an AC adapter (sold separately).